Monday came and we started our first day of homeschool for Isabella's second grade year. I have to admit that this is the first year in almost 10 years of homeschooling that I felt a bit unprepared. Call it experience or crazy but I felt that it would all fall into place, and it did. I started buying this years school books in May and every month I added a new subject and purchased the supplies. I had everything I just did not get around to creating a schedule until the night before. I didn't make a single copy this year. Last year I copied and copied and then added a few more copies. In fact I over copied and wasted a lot of paper. This year I am not going to do that. I have been copying the workbooks to save for the next round of homeschooling (remember we had another kidlet so I will be homeschooling well into my 60's) but I decided that the space gap between the two kids is too big and I will buy new books. Heck, by then everything may be online. The night before I sat down and went over the schedule with Cory. I am excited for this new year. 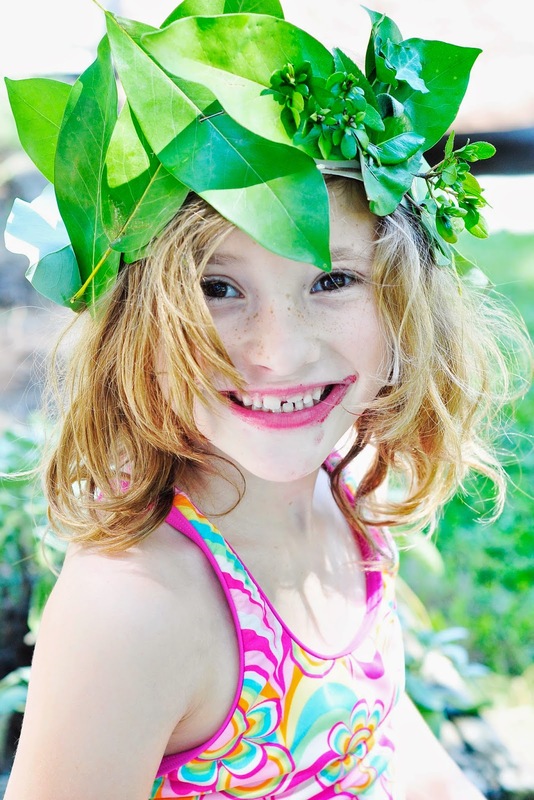 We are introducing several new subjects that I think Isabella will find fun, exciting and challenging. The new subjects are French, Cursive, and Latin/Greek Root Words. The subjects we already do are: English, Math, History, Geography, Art, Reading, Spelling, Phonics, Health, Science and PE (she does 7 hours a week of gymnastics). She also takes piano and a theater class. We are planning a trip to London and France next spring. We are learning French as a family. We are busy! Very very busy and she is socially involved in a variety of events throughout the year. We schedule as many field trips as possible because I believe learning is best done with a lot of hands on experiences and visits to related sites. We live in a wonderful metropolitan area filled with historical sights, history museums, zoos, art museums, and theater venues. By the end of the school year we are ready for our summer to be free--but we are not to that point yet--we just started. 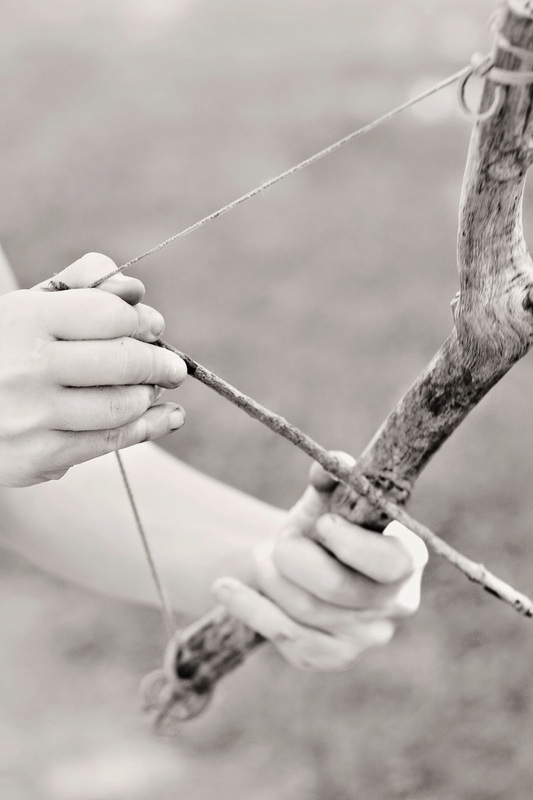 I thought I would spend some time this year talking about our homeschool experience on my blog. I run into a lot of people that have questions and I hopefully can answer some of those questions through the comments section. I also want to share some of our projects, what our days look like and hopefully inspire some future homeschooling familys. At the end of July I went through all of Isabella's crayons. I actually read every color and kept two of each color and bagged up the rest. I found that at the end of the year we were stuck with a lot of the same colors and all the "good" colors were gone. I still don't know what happened to the red crayons--LOL She must use this color the most. I searched on Pinterest for some uses for the used crayons. I also thought about donating them to a preschool for some of their art projects. In the end we decided to make our Sun Catcher. It was easy and fun to make. The messy part was the crayon shavings but I put a towel under the wax paper and this caught all of the stragglers. I have a Pinterest board that I post most of our Homeschooling worksheets, project ideas and future ideas on. Here is the link if you are interested in seeing which sites I use to get free sources for our curriculum. This project does require adult supervision for two things: the ironing and the sewing on a machine. 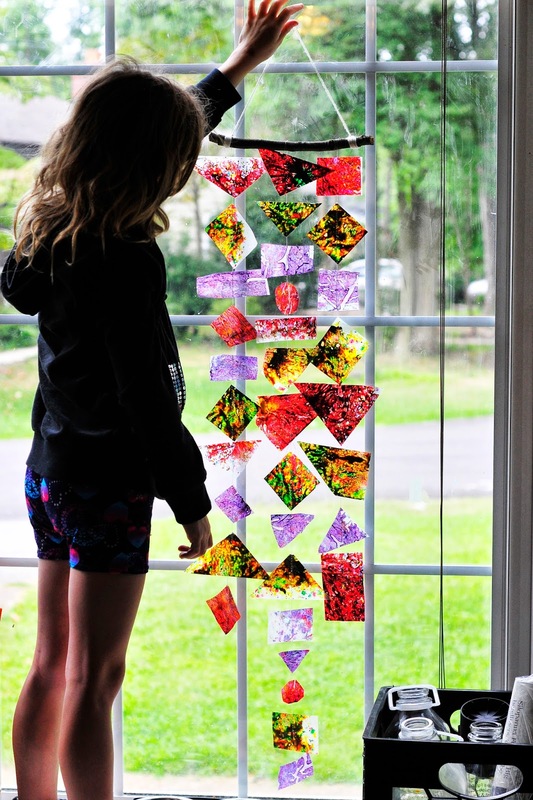 The rows of cut wax paper art can be tied together by using a hole punch and fishing line/string if you do not own a sewing machine. Along with making the sun catcher we started our history study with the Roman Empire. Isabella is fascinated by this time in history. We went to the Renaissance festival as well. The combination of these two events has inspired a lot of free thinking. 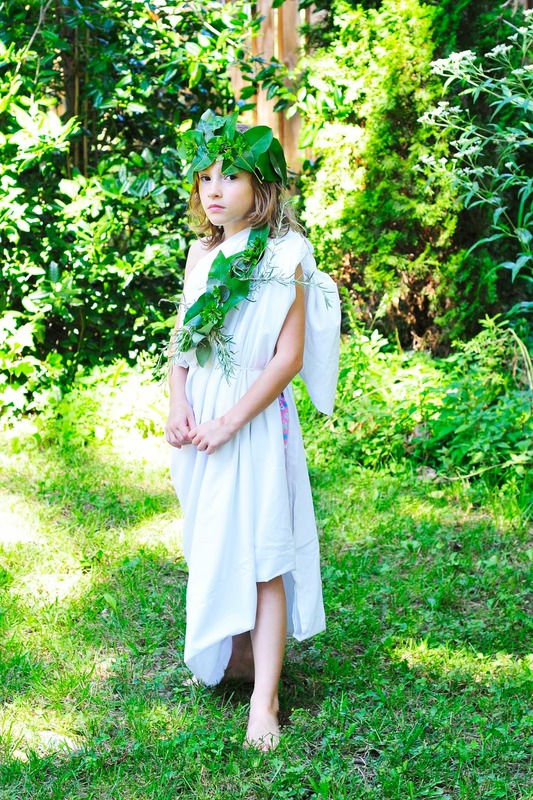 She made a laurel wreath and wanted to become a Garden Goddess or Fairy. She made her own bow and arrows. I love the creative process that homeschooling affords our family. We are constantly looking things up, asking questions, researching and learning. All summer we are learning but during school we get down to specifics and dig a little deeper. Pictures for instructions are below. 1. Turn iron to high heat. Lay a towel on table or over ironing board. 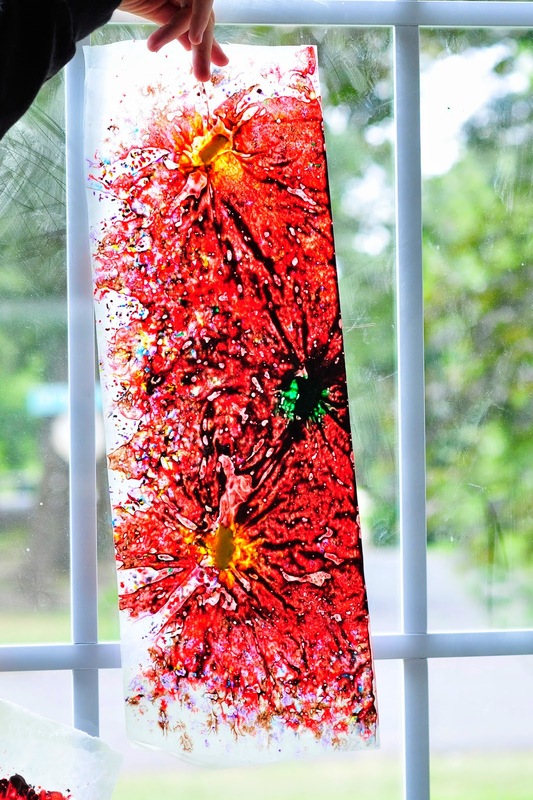 You want to protect your board from melted crayon. 2. 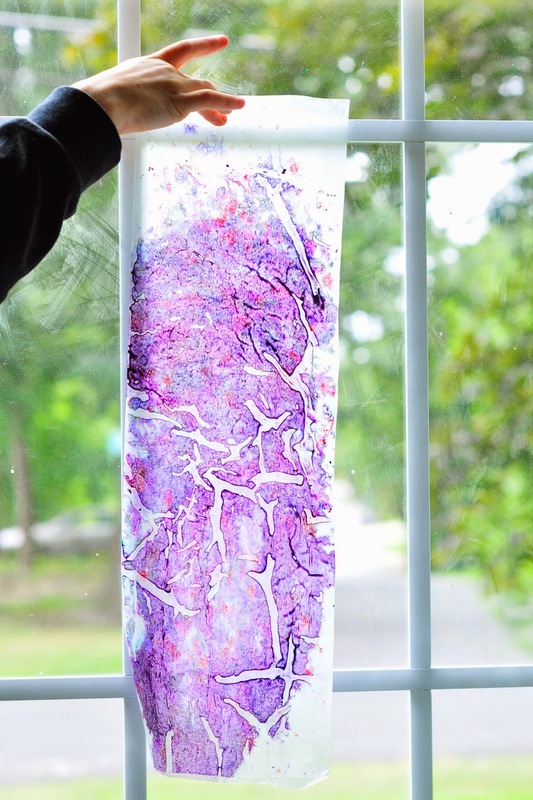 Tear a piece of wax paper about 20 inches long and fold in half. Open the wax paper and start to grate the crayon on the side laying closest to the towel or ironing board. See pictures to see how much to grate. The more you grate the thicker the sun catcher will be. Thick pieces do not melt easily. 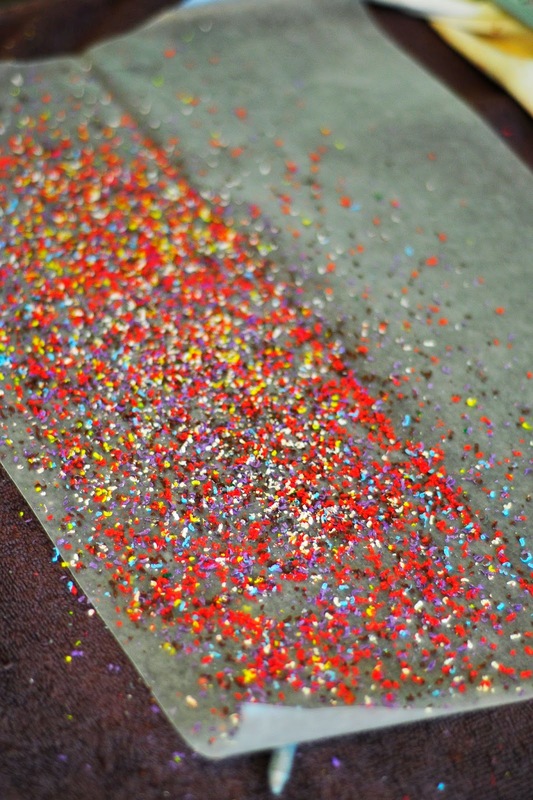 When you have finished grating crayons gently refold the wax paper over the top. 3. Lay a thin towel on top of the folded wax paper. 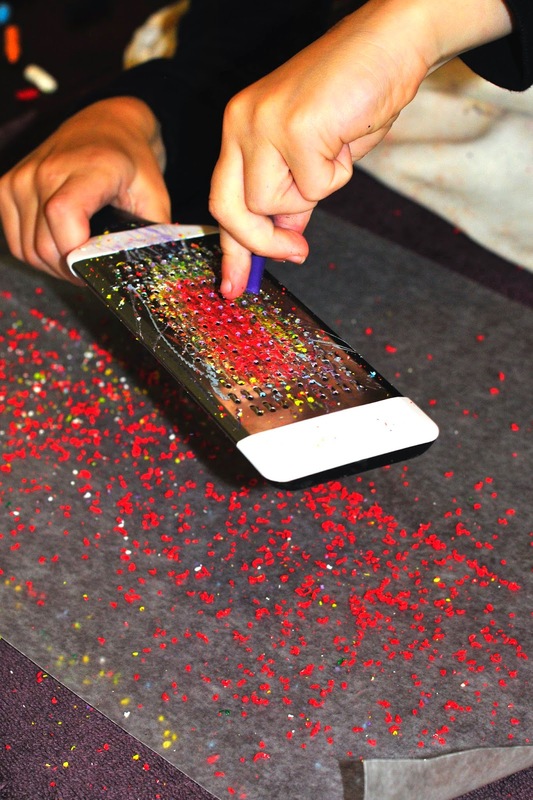 There are two ways to heat the crayon shavings. 1) is to "iron" back and forth. This will BLEND the colors. 2) press down and wait a few seconds, lift, and set down again. Repeat until the crayon is melted. 4. 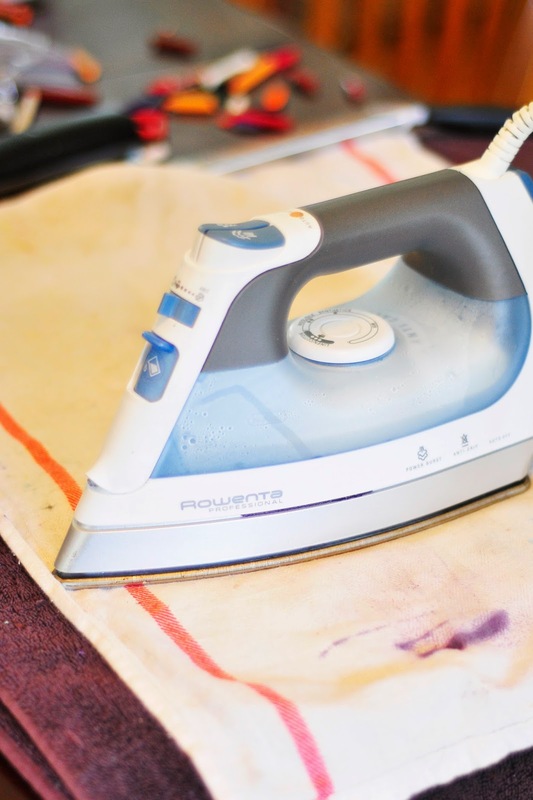 Remove iron and towel to make sure the wax has melted. It should be cool. Set aside and make 3 more strips. Use any color combinations that work best with your project. wood so that you can hang it in your window. 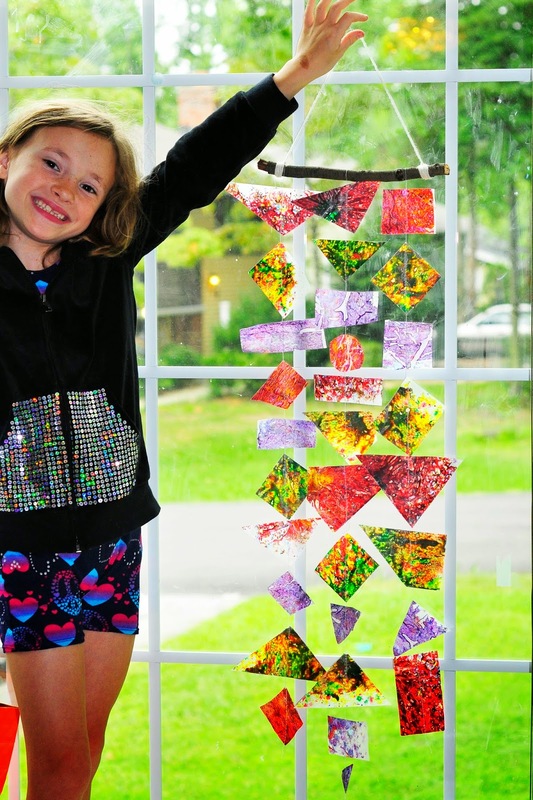 Add three rows of sun catcher crayon shapes.